Sometimes a design is just right. Perfection is achieved when the designer puts in just the correct amount of features and quality, then wraps the whole lot up in a decently styled package. This was very much the case with the Sony TC-229SD cassette deck of 1977. 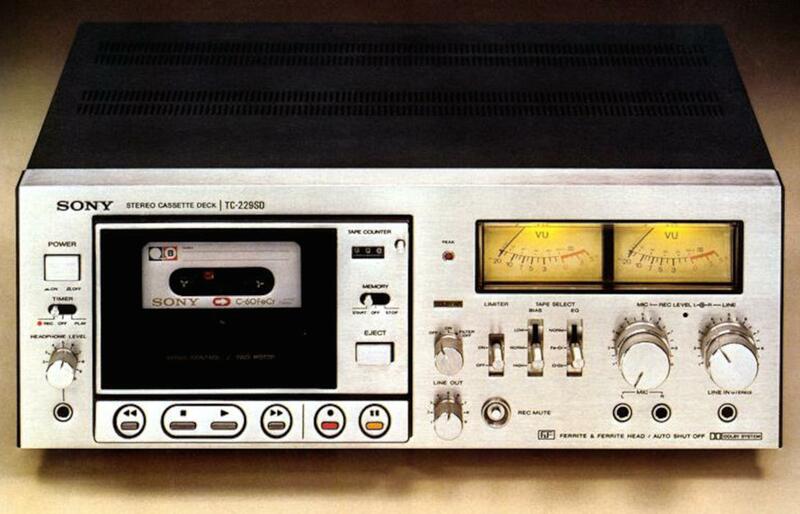 Remembered mostly for its outward similarity to the failed Elcaset models EL-5 and EL-7, the TC-229SD was a fine recorder in its own right and went on to be the basis for Sony’s two top models as the nineteen seventies drew to a close. These were the TC-K7B (essentially the same thing) and the TC-K8B, which added exotic LCD peak programme meters – as seen on the TC-K60, amongst a select few others. Cassettes were initially all about miniaturisation but the TC-229SD is a large, heavy machine. Even so, the design is attractive due to the detailing and the quality of the finish, Sony traditionally get this sort of thing right and here there are a few extra treats; the knobs for example are machined from solid aluminium and the tape transport controls are tiny keys which command a solenoid operated deck. These keys look simple but are just about the nicest controls that any cassette deck ever had. Each is damped with a silicone membrane behind and the logic of the circuitry mimics the operation of a conventional mechanical transport perfectly, press and hold ‘record’ then push ‘play’ to start a recording for example. There’s even ‘punch-in’ recording where the machine will go straight from playback to recording without stopping the tape. The making of the TC-229SD though is the transport mechanism. Sony’s engineers thankfully abandoned the fickle dual capstan arrangement of the previous top models in favour of an oversized flywheel to ensure speed stability. This was combined with an FG servo motor (the most accurate of the various types available at the time) to produce a drive of great stability, and a claimed wow and flutter figure of 0.06% WRMS. Just two heads were fitted but the record/playback one was Sony’s own ‘F&F’ ferrite type whose mirror black finish is prominently visible at the bottom of the unusually large cassette viewing window. This is effectively wear-proof, a life of twenty times longer than conventional types was claimed which in practice means you never have to worry about it. The TC-229SD deck used a second motor for the winding functions; this made finding a particular track on a cassette swift and silent. The thought that has clearly gone into the design and the quality of its implementation makes the TC-229SD a joy to use. Originally they were optimised for Sony’s Ferrichrome tapes but now that these are no longer available it is best to re-calibrate the machine for something like modern TDK SA – an easy task since the internal presets have plenty of range. Set up and biased to the maker’s specifications the TC-229SD gives bright and stable recordings set upon a massive sound stage, a good one should run a mid-range reel to reel (such as Sony’s TC-399) close in sound quality terms. Pitch stability is excellent, there is no substitute for rotating mass it seems. The ballistics of the VU meters are lazy so with Type II cassettes it is best to only let the meters get up as high as -5dB on the scales, and ensure that the ‘peak’ indicator does not light. With ferrics the situation is different, you can go all the way up to the red sector and still get clean results if your choice of tape is up to it, TDK AD, BASF LH-E1 and Sony HF are all good choices if the machine’s setup matches them. The first generation ferrite head imposes an upper frequency limit of around 15kHz, which is not as disastrous as it sounds – all it does is to knock a little of the sparkle off the top of certain CD recordings. For the record, Sony claimed 30Hz-16kHz (at –3dB) and a 60dB signal-to-noise ratio (Dolby off) with premium Sony FerriChrome tape. At around £280 in 1977 these were expensive machines but still sold well, it is not hard to pick one up if you keep a look out. They are tough too, the deck only has two belts and since all the lifting and pushing is done by solenoids it doesn’t jam up once the main one gets a bit baggy. A common problem is lack of reel drive in some or all modes as a result of thickened lubricants in the linkages which support the various idler wheels. This can usually be resolved with a bit of mechanical tinkering however, replacement parts are seldom needed to cure this one. The key parts like heads and motors are durable which is good news; the little lamps with which the fascia is peppered can fail though which is something that will annoy the perfectionist.